600T/H Stone Crushing Plant is the biggest capacity in Korean market but a lot of bigger capacities in worldwide especially Middle east crushing plant, Oceania crushing plant & Latin America crushing plant such as Saudi Arabia Crushing plant, Australia Crushing plant, Chile Crushing plant. Jaw crusher FSK-6048 used to crush as primary crushing, Cone crushers CC-2100 & MC-300 are for secondary crushing or Tertiary Crushing plant. Sometimes it needs quaternary crushing plant such as Vertical Shaft Impact Crusher to product sand. It has only for Stationary crushing plant type. 600Ton per Hour crushing plant is used to crush stones smaller than about 1100mm such as river stone, granite, basalt, limestone, mixed stone etc. and this 600t/h stone crushing plant is suitable for crushing all kind of hard rocks, stones, minerals, recycling construction waste etc. Stationary crushing plant and mobile crushing plant (portable crushing plant) are available. Stationary crushing plant has fixed plant structures. Crushing processes are as followings. Firstly, Massive stones are evenly sent from feed bin to jaw crusher for rough crushing through vibrating feeder, then to cone crusher or impact crusher for further crushing sent by belt conveyor. Secondly, through belt conveyor, the fine crushed stones are transferred to vibrating screen for screening, so stones of different sizes will be screened out. 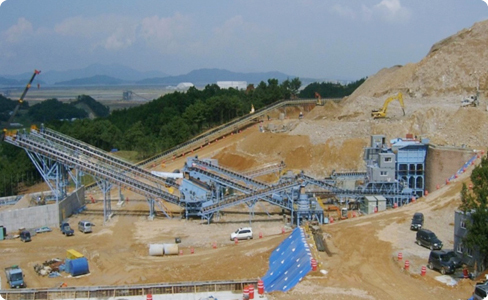 Thirdly, the stones which meet requirement of finished products will be transferred to finished products pile, while the others will be sent back to cone crusher or impact crusher by belt conveyor for crushing again. In this way the closed-circuit cycles are formed. According to clients’ requirements, combination and classification of finished particles can be conducted.